MANILA, Philippines — The Professional Regulation Commission (PRC) and the Board of Electronics Engineering (BEE) released official results of April 2018 Electronics Technician (ECT) board exam on Thursday, April 12 or in three (3) working days after the last day of exam. The full list of passers, top 10 (topnotchers), top performing schools and performance of schools are available on this page as announced online. 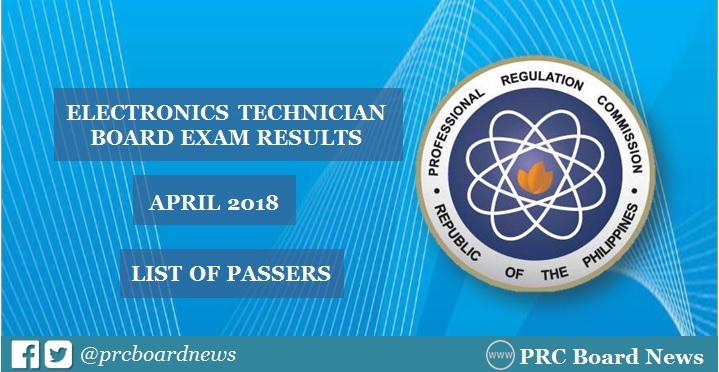 PRC: 1,141 out of 1,483 passed the Electronics Technician Licensure Examination. PRC administered the ECT licensure exam in the cities of Manila, Baguio, Cagayan De Oro, Cebu and Davao on Friday, April 6, 2018. PRC also conducted the Electronics Engineer (ECE) board exam on Wednesday and Thursday, April 4 and 5. The April 2018 ECT board exam covered the technical subjects, laws and ethics: basic mathematics, Ohm's Law, Electronic/Electrical Machine or equipment, test equipment, electronic/electrical component, maintenance and repair, Philippine electronics and electrical codes and R.A. 9292 or the Electronics Engineering Law of 2004. According to PRC Resolution No. 2017-1068, the target release of results for the recent ECT board exam is on Thursday, April 12 or in 3 working days after the last day of exam. In the April 2017 ECT board exam, results were released in three (3) working days. A total of 1,020 out of 1,273 passed the licensure exams. Mapua University (MU) was named top performing school with 100% passing rate or all 83 takers passed the exam. The results of April 2016 exam were also released in the same total working days. PRC named 985 out of 1,196 who successfully hurdled the board exam. MU aced the board with 100% passing rate or 98 examinees passed.